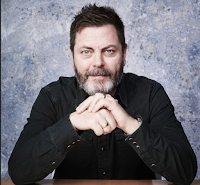 Parks and Recreation star Nick Offerman is joining the cast of Amazon and BBC’s supernatural drama Good Omens. Offerman will play the U.S. Ambassador and father of the child Warlock in the six-part series, which is based on the novel by Neil Gaiman and Terry Pratchett. He is the latest high-profile star to join the cast, which features Michael Sheen as angel Aziraphale and David Tennant as demon Crowley as well as Jon Hamm and Miranda Richardson. “There may not be anyone alive who can deadpan a line quite as well as Nick Offerman. He’s a terrific performer, and has to say a lot of things in Good Omens that are humanly impossible to deliver with a straight face. Fortunately, Nick is not entirely human,” said Gaiman.